Who knew that the Boston – Baltimore route was so coveted? Apparently Southwest, AirTran and jetBlue are convinced it is. The three carriers have launched a bit of a price and points war on the route this week. For starters, there is the fare – starting from $49 each way plus tax. That’s not too shabby, especially considering the pretty wide open availability of seats at that price unlike some sale fares that are quite limited. On top of the good price, however, all three airlines are also offering bonus miles on the route. AirTran is offering double A+ Reward points while jetBlue is offering triple TrueBlue points. Southwest is also offering a bonus. Registration is required for both promotions. Neither offer is enough to get me to go out of my way to fly the route, but always good to know that there are still some pockets of competition where the airlines are vying for your business. UPDATE: Updated noon Friday EDT to reflect Southwest’s participation in the fun. When did JetBlue announce that? Was it a match to AirTran’s promotion? Southwest also matched this week with double Rapid Rewards. 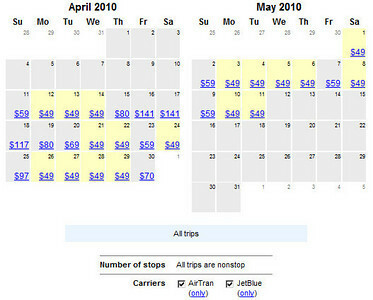 Until August this was AirTran’s market with nominal competition from Comair. Then Southwest came in, and JetBlue quickly said it would start operations in BWI. Delta/Comair wisely dropped the route once Southwest had announced. jetBlue announced the promo a couple days ago. I didn’t realize that Southwest was in on it, too, though that makes sense since they have a few frequencies on the route, too. Still strange that such a random route has so much competition and appeal to those carriers. It doesn’t seem like a particularly premier route nor does it appear to have particularly great yields to make is something in such demand. I just went and looked and don’t see the Southwest bonus on this route. Are you sure there is something going on there for Rapid Rewards?